Our eldest daughter, Hailey (14), is quite the artist. She's creating cartoon shoes for her friends, and I'm so proud of her. She's totally self-taught and her talent amazes me. Hailey has always shown that she has a knack for all things creative. She's a great writer, musician and artist. Her mother was a band geek, and I was an art nerd, so I guess that might explain some of it. Regardless, there are few things in life that are more rewarding than seeing your kid do something that you relate to, and to see them enjoy it and really excel at it. 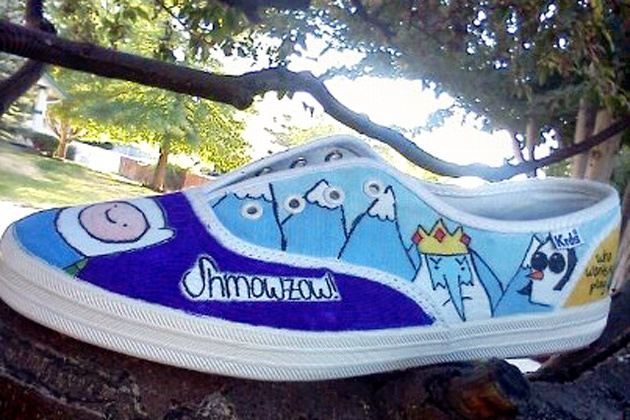 She's and her sisters are fans of the animated show Adventure Time, and she recently started coloring canvas shoes in the theme of the show. Her shoe designs have become popular, and now she's creating them for her friends. The shoe you see here is half of a pair that she's currently working on. She even took these pictures. As a kid I was always interested in art, but in my early teens I really wanted to be a cartoonist. It didn't work out for me, but it really is cool to see your kids develop a talent in something to which you once aspired. Go, Hailey, go! Your daddy loves you and what you're doing! I'll never push you, but I'll always encourage you. These are awesome. I clicked on the pin thinking they MUST be in a store somewhere (my kids are Adventure Time fans). Your daughter did a great job! That is completely awesome. My kids (and husband and I) love Adventure Time. 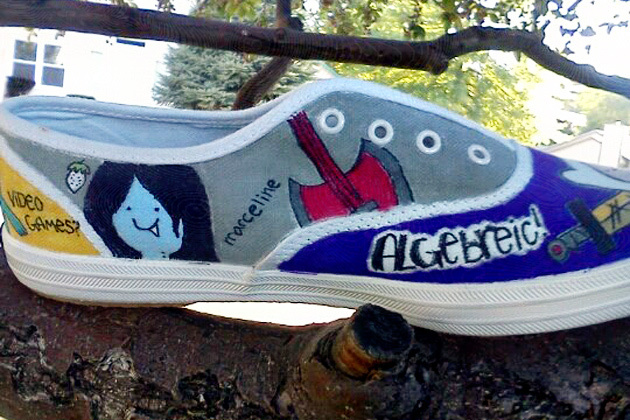 I would absolutely wear those - she did an amazing job! How cute is this. When are you going to start taking orders? Very talented! Color me impressed.